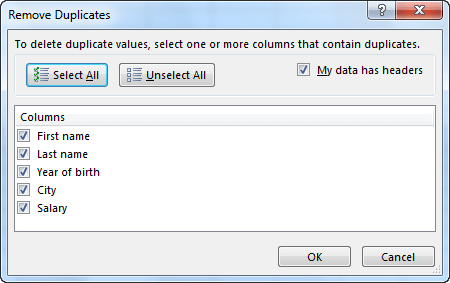 Click any cell in the table and select DATA >> Data Tools >> Remove Duplicates. If you select all columns then nothing will happen because each row in our example is unique. But suppose you want just the “Year of birth” to be unique. Then, leave only this position selected. After confirming, all the rows with duplicated years will be removed.